China has become increasingly vigilant about ferreting out official corruption, bribe-taking and dereliction of duty, according to a report published Monday in the state-run media. The authorities conducted 12.7 percent more investigations in the first half of 2012 compared to the same period last year, the China Daily newspaper said in its lead story. More than three-fourths of the cases were for corruption and bribery, notably in the engineering, construction, rail and transportation sectors, and also in finance and real estate, the paper said. Its article cited remarks by Song Hansong, a director of the corruption prevention department of the Supreme People’s Procuratorate. Mr. Song cited the case of Zhou Jinhuo, a former administrator in Fujian Province who has become a kind of poster boy for official malfeasance in China. For the past half-dozen years he has often been mentioned in anti-corruption stories, editorials and Communist Party campaigns. Chinese authorities said Mr. Zhou took $16 million in bribes in exchange for the awarding of industrial and commercial contracts under his control. He wired the money abroad and then fled to the United States — following his wife, who had already obtained U.S. residency and a green card. “He is still a fugitive there,” China Daily said. Chinese netizens coined the term luo guan (meaning naked officials), which refers to officials such as Zhou, who escape trouble by moving their spouse and children, along with their assets, to a foreign country. They plan ahead by depositing money in accounts under the name of their spouse or children. Even if they are apprehended, the cash transferred to overseas banks often remain the property of family members. An increasing number of officials engaging in this scam has frustrated investigators and have challenged the level of tolerance for such behavior among the public. The Chinese business magazine Caixin reported earlier this year that China’s central bank believes as many as 18,000 officials and employees of state-owned firms have left China since the mid-1990s, fleeing with an estimated $127 billion. 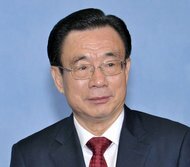 After staging its once-a-decade leadership transition next month, the party will undertake a five-year plan for eliminating corruption, Xinhua has reported, citing He Guoqiang, a member of the Standing Committee of the Politburo. Two disciplinary and watchdog agencies of the party said recently that nearly three-quarters of a million officials nationwide now receive anti-corruption education every year. “Education is given through lectures, case studies and visits to historic areas, as well as attendance at court trials and talks with people who have been imprisoned for corruption,” China Daily reported in its story about the party circular.